Feed a crowd with this easy yet scrumptious Potato recipe. Besides the fact that it feeds a ton (20 servings), it can be made up to 2 days before, and no potato peeling required, but your guests might not believe that! Ok, I'm going to confess here, I H.A.T. E. peeling potatoes. There I admitted it. If we ever have "real" mashed potatoes my husband has to make them! When I came across this fantastic recipe from Hungry Jack in 2010, I knew I had to try it. So, I made it for my next potluck and it was a rounding success! It has richness and flavor you wouldn't expect from a package of potato flakes. See the end of the post for making it in advance. Heat oven to 350 degrees. Spray a 13x9 inch baking dish with non stick cooking spray. Heat water, butter, garlic seasoning and onion powder to boiling in a 6 qt. saucepan. Add cream cheese, evaporated milk, and sour cream, stirring until cream cheese is dissolved. Stir in potato flakes, mixing until all ingredients are well combined. Spread mashed potatoes into prepared pan. 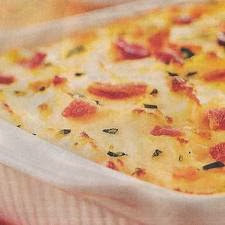 Top with crumbled bacon before serving if desired. Make potatoes according to above directions, and stored, covered up to 2 days. Remove from refrigerator, spray baking dish with non-stick spray, spread potatoes into pan and bake as directed.